CLICK HERE to Download NSC8 circular ".pdf"
CLICK HERE to Download NSC8 schedules ".pdf"
Your Registration Number is : 72. Please remember this registration number this will help you in further processing. The reference is known now. Click Here for "About this Author"
This contribution concerns itself with the HR PMR measurements in single crystalline solids, by which the chemical shift tensor of protons in organic molecules would be determined. In these series of experiments, after the elaborate acquisition of data followed by analysis, invariably, a situation would result in which the analyzed data do not reflect the requirements according to the molecular symmetry for the orientation of the principal directions of the chemical shift tensor. These conflicting results could not be reconciled until a simple approach to try to account for the intermolecular contributions to the shielding could be envisaged, based on the experiences in the HR PMR in liquid state. This approach was the well evidenced neighbor group contributions to isotropic chemical shifts calculable in several contexts satisfactorily using the magnetic susceptibility anisotropy of the neighbor groups. Samples of spherical shape were used for making the measurements because of which the bulk susceptibility contributions to chemical shift were ensured to be zero. The contributions from the neighboring molecules within the Lorentz sphere had to be calculated and subtracted from the experimentally measured chemical shift values to result in a Tensor that reflected the intramolecular symmetry. These results  first established in 1979 has subsequently triggered a cascaded effort. Investigations as to whether this kind of neighbor contribution can be dependent upon the shape of the hypothetical boundary around the specified proton site. A spherical enclosure, the Lorentz sphere, in these contexts is conventionally known; but, ellipsoidal enclosure around the specified proton is never found to be mentioned. An argument seems possible that, as much as within a spherically shaped specimen the bulk susceptibility contribution is zero, within an ellipsoidal shape for the specimen a hypothetical ellipsoidal semi micro cavity can be carved out around the proton site for which the induced fields can be zero at the proton site. These subject matters seem to evoke the interest of specialists in condensed matter physics with regard to the induced field patterns within magnetized (magnetic) materials . These consequences have simplifying features in such a way as to appeal to chemists  as well. This perspective would be explained in this contribution. 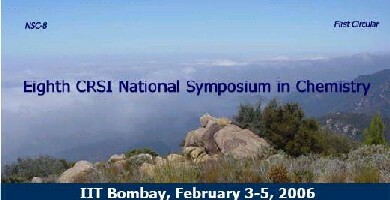 > Looking forward to meeting you at NSC-8. Most of the Contents for this presentation would be from the recent presentation made at the 4th Alpine Conference on SSNMR at Chamonix Mont Blanc, France during September 11-15, 2005. Below are Links to powerpoint '.ppt' and '.pdf' files prepared for the context of the 4th Alpine conference on SSNMR. NOTE While downloading, when the dialogue box appears prefer to SAVE to resident disk instead of opening the downloads directly from the website. hope this information will help in your poster preparations. Above in Appendix:CONSIDERATIONS of a trend Setter for Quantitive Criterion: "Discreteness to Continuum "
ICMM-2006 is organized with the intension to promote close professional interactions among scientists through wide ranging discussion and critical debate on recent scientific advancement in chemical science and technology. The conference shall encourage interdisciplinary research growth and strengthen relation between various industries, research laboratories and institutes of learning for building knowledge economics. The combined efforts and interaction shall lead to draw a common strategy for sustainable developments of science and technology which can be exploited for the benefit of mankind.